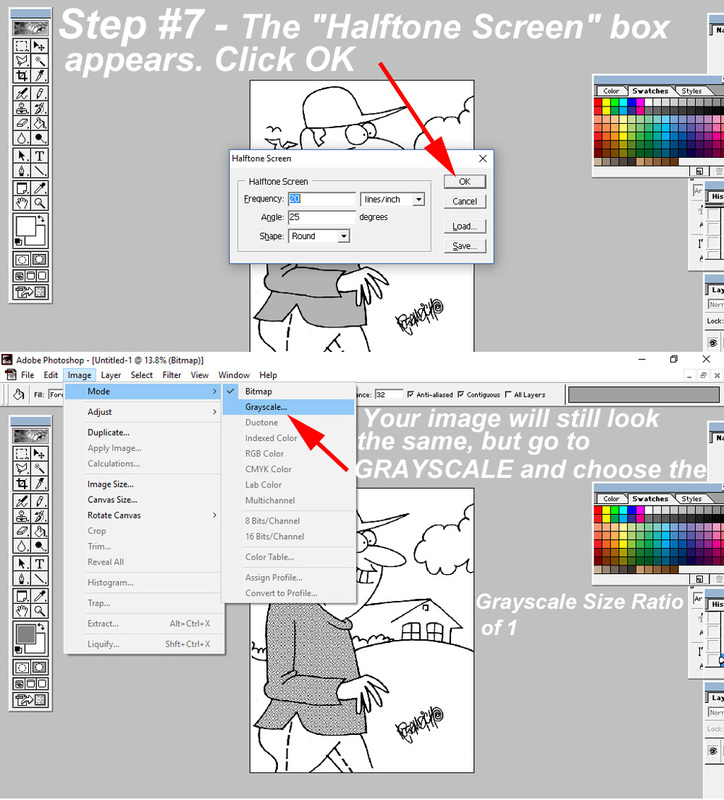 Adding halftones to line art cartoons is relatively simple with my basic Photoshop 6.0 program that I use. 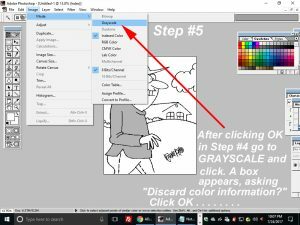 You can literally make your cartoons look as though you’ve added zip-a-tone shading film to your image like the comic strips in newspapers. 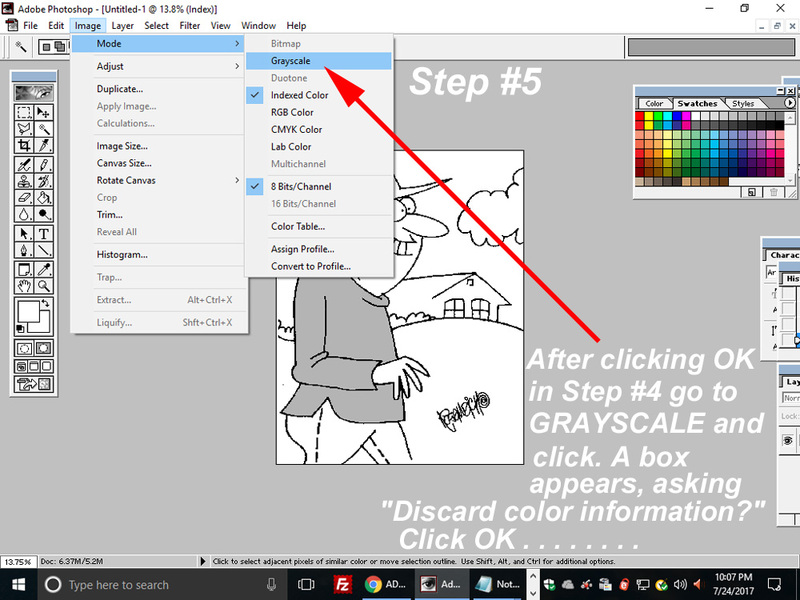 Adding Photoshop cartoon halftones steps are listed in sequence here to follow. Prior to going through all the steps mentioned further, convert your cartoons to RGB mode or RGB color as mentioned above. 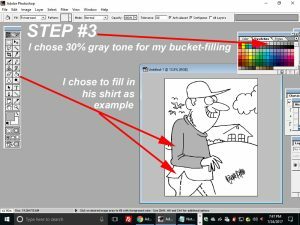 The gray tone I added in his shirt was chosen at the 30% tone. 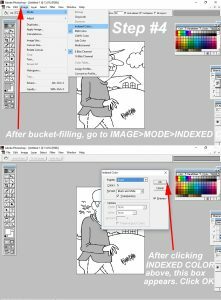 Keep in mind, choosing different percentages in the tone, will intensify or lessen the actual visible appearance of the “dotted appearance” of the look to your halftone. 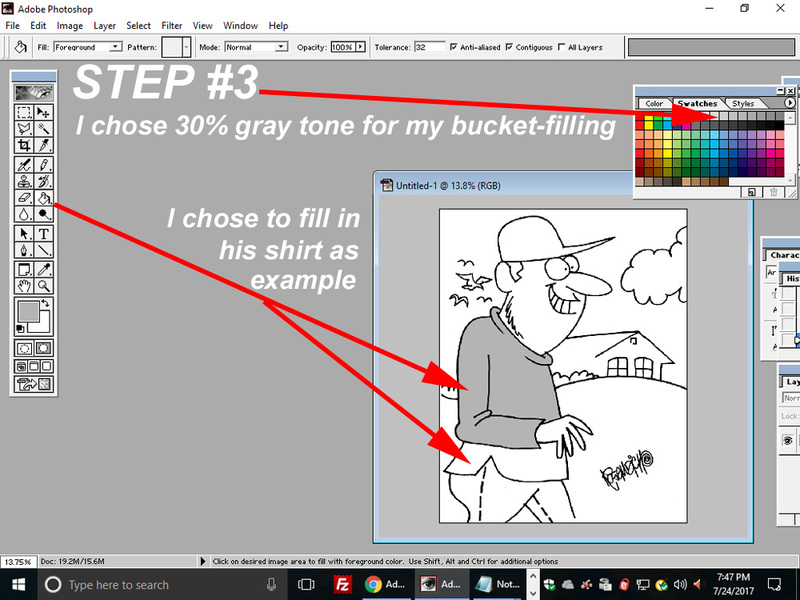 Now the fun part is anticipating the fact you’ll actually be seeing some dotted zip-a-tone type of look to your cartoon after following the steps in Step #4! 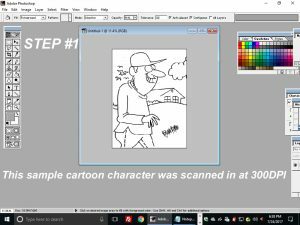 Step #7 is now the most interesting, since it will finalize all steps that leads to enhancing the cartoon with the “dotted” or halftone look and feel that you see in many cartoons appearing in the comic strips or those cartoons you see on line. Important! Pay attention to the ‘Halftone Screen’ settings in ‘Frequency’ and ‘Angle’….you can use those percentages here or increase them as you experiment. Experimenting will also be important, and I highly suggest it! 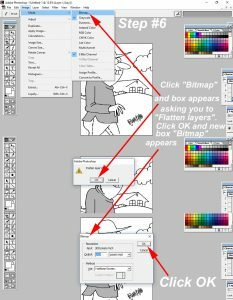 For instance, that ‘Round’ setting in ‘Shape’ will result in your dots being round of course, and that’s what enhances the effect you see at the very end of this short tutorial . . . Finally! 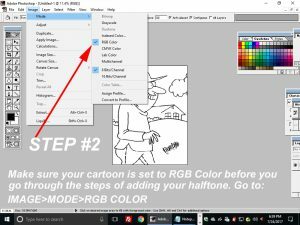 Set your image BACK into RGB mode. 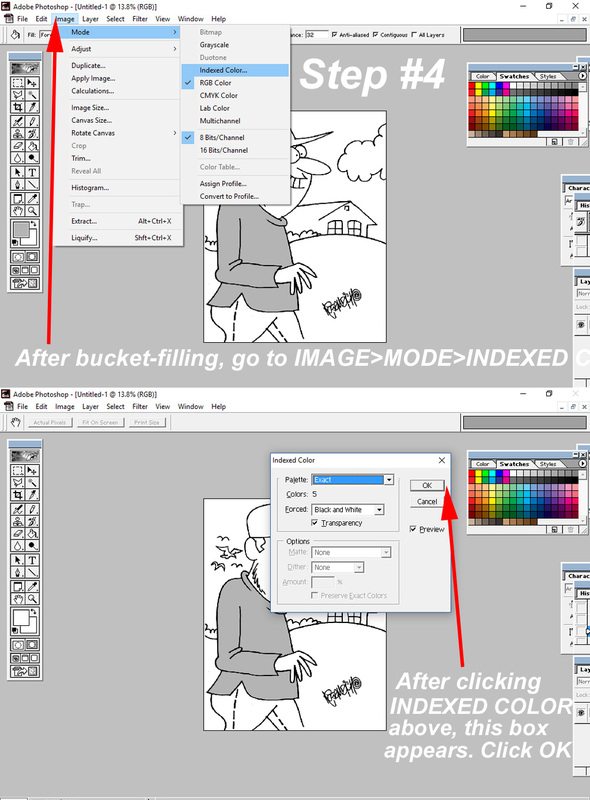 From this point, just save a raw PSD file on your hard drive from which to work from. Then size the cartoon to your preference. I sized this cartoon at 1000pixels wide in JPEG format so you can click the cartoon to enlarge it and examine the results. 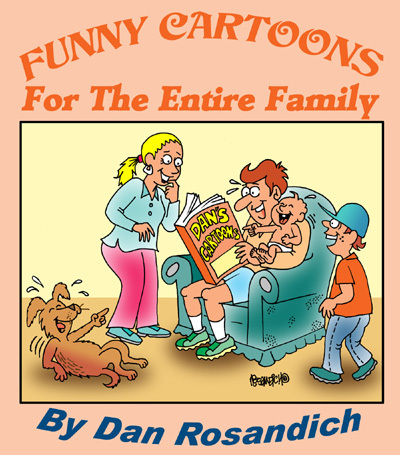 Does this look like what you see in the funny papers? Think about it! 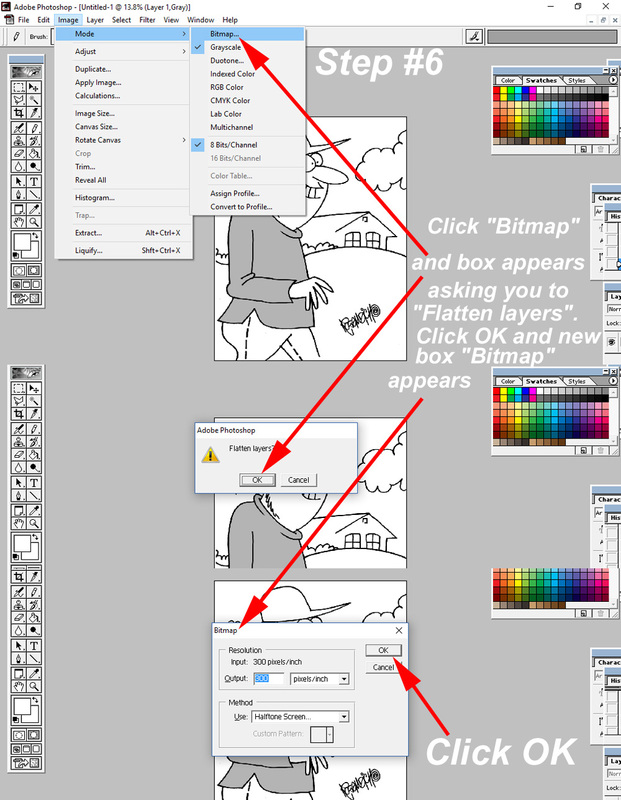 Final thoughts on adding Photoshop cartoon halftones. 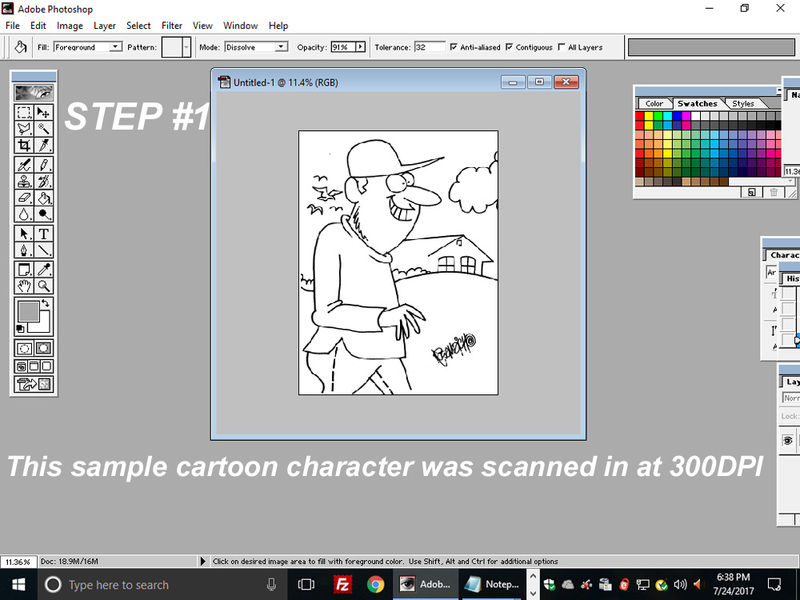 Steps I offer here were basically spontaneous and from memory, to create this cartoon post. I recommend experimenting with your software though, because you can even minimize the number of steps I’ve listed here. I still have alot of halftone shading film but it takes time to add, and using Photoshop speeds up the process. Especially if you’re working online more and more. Which is what I find myself doing! I really hope this short tutorial has helped in some small way and contact me with any questions! I’ll answer as best I can.